This is Kim in Renaissance mode. The precise central parting. The Mona Lisa skin. The mysterious faraway expression, with that delicious hint of underlying strength. Put a ferret in her arms and she could almost pass for Leonardo’s beautiful Lady with an Ermine. Actually, I think the reference is more specific. What we have here is a very passable Californian approximation of Raphael’s portrait of his mistress, La Fornarina, usually identified as Margherita Luti, which hangs in the Palazzo Barberini in Rome. Either Kim has actually been there or, more likely, someone sent her the postcard. The mother and child is, of course, one of art’s most beloved images. In the old days, images of the Virgin Mary and Jesus were found in every Christian church: she sitting there beatifically, oozing love; he fiddling with various symbolic accoutrements representing his sacrificial future. Together, they filled us with hope and a sense of salvation. That doesn’t happen here. 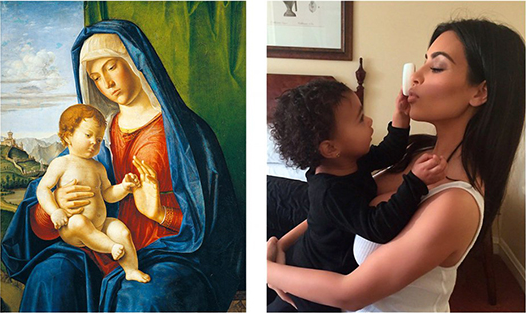 For a start, North West is actually a girl, who seems to be rubbing a bar of soap across her mum’s face. She’s also wearing black, a colour usually associated with Jesus’s archenemy, Satan. Kim’s casting is more convincing. Like the Virgin Mary, she looks immaculate and excellently coiffed. In art, the Virgin Mary is never seen with baby stains on her shoulder. On Instagram, neither is Kim. Despite the blonde hair, everyone knows this is Kim. The giveaway is the spectacular arse, which looks as if it were purchased from a shop selling beach inflatables. If you’re ever drowning in the sea, grab the nearest Kardashian. Among the great back views of art, The Rokeby Venus, by Velazquez, is but a pair of table-tennis balls compared with these mighty Kardashian roundels. The same can be said of Boucher’s notoriously improper back view of Louis XV’s mistress Louise O’Murphy. Even Rubens never matched these proportions. In the battle of the buttocks, the only real competition Kardashian has is Courbet’s The Bathers, in Montpellier, which I would still rank the winner. Just. This was taken at the Grammys. 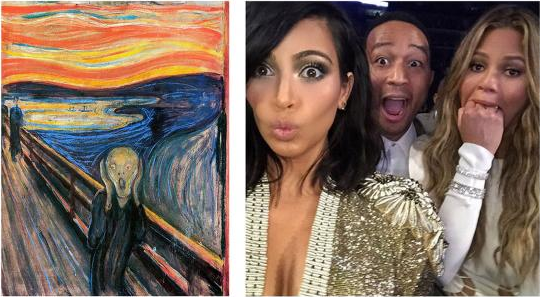 It was the Kardashian response to Beck winning Album of the Year ahead of St Beyoncé. To indicate her disapproval, Kim has put on an expression of wide-eyed surprise, while making sure her signature breasts squeeze themselves into the bottom of the image, in case no one recognises her. Artistically, Munch’s Scream may have been her inspiration, although in this case the deep psychic terror of the Scandinavian original has been replaced by a physiognomy more commonly encountered on the arse of a cartoon cat. The chap behind, gaping like a fool, styles himself with the idiotic name John Legend. His real name is John Stephens. This is an image that plays cunningly with one of art’s most legible sights: the woman in the mirror. So legible is the image that pretty much any society from the Egyptians onwards would have been able to decode it. 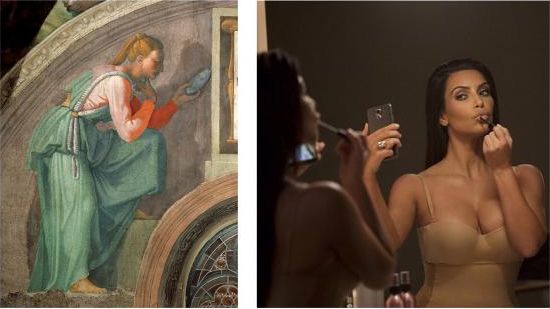 In art, women looking into mirrors are always symbols of vanity. In Venetian painting, the surest way to signify that the girl in the picture was a courtesan was to give her a mirror to look at. Up on the ceiling of the Sistine Chapel, what has Michelangelo painted to indicate the terrible consequences of human vanity? A woman looking into a mirror. 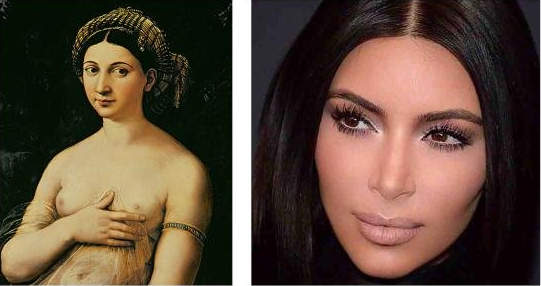 That said, most of the women in art don’t have Kim’s heroic entablature. Look how it stands out. I like this one. It’s scruffier than your usual Kardashian feed, with an entirely ridiculous low-life mood. Outside the picture are the bodyguards, the chauffeurs, the hairstylists, the nail artists, the nannies and the bracelet carriers who make up the Kardashian entourage. Inside the picture, it’s just Kim and Kan, looking mean and alienated, sitting next to the ketchup in a humble diner, next to John Legend again. Who’s real name is still John Stephens. Kanye is so poor, he can’t afford a new pair of trousers, and the rip in his jeans is as big as the ones you find in Murillo’s paintings of Sevillian beggars. Kim, meanwhile, has had to make do with a humble animal skin thrown across her shoulders in the manner of John the Baptist, who spent all those years in the wilderness: “his raiment of camel’s hair, and a leather girdle about his loins; and his meat was locusts and wild honey”. Sad.